Connectivity: 2G, 3G, 4G, Bluetooth, GPRS, GPS, Quad-Band, Tri-Band. Features: Email, 3G Data Capable, 4G Data Capable, 4K Video Recording, Accelerometer, Camera, Colour Screen, Fingerprint Sensor. This iPhone is in 100% fully working, fully tested, with 12 month's warranty included. Included is 1x USB data / charge cable only, no other accessories are included. This iPhone is Factory unlocked so will work with any network. 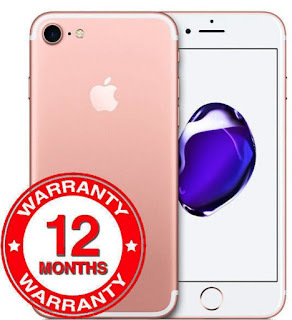 Free 12 Month Warranty Included! !